There are certain builds that cannot aesthetically work with M-Lok. Call me one to wax poetic of the A2 and A4 series of rifles, but slim modular rails don’t look appropriate. They also aren’t as robust as quad rails. It’s true. With more screws, the more potential we have to have screws loosen. It’s just what they do. I must bow to practicality however… in the age of the lightweight rifle, quads don’t make as much sense. Except when they do. We need to thank Bravo Co. for releasing a quad rail in a market that has largely moved away from the cheese-grater system. How does it stack up to other quads on the market? 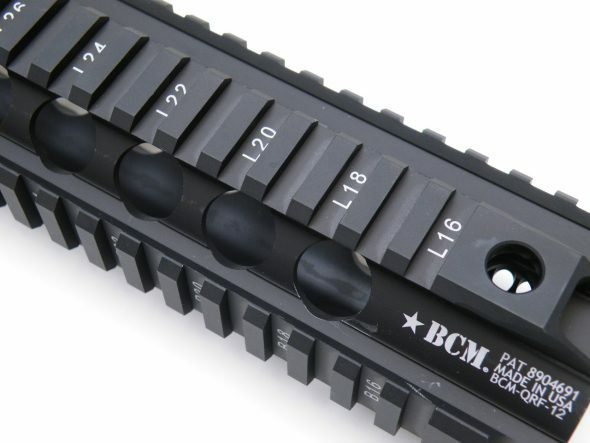 The BCM QRF is a standard not-so-standard quad rail. It’s standard in that it has 4 rows of picatinny rails. It’s not so standard in that it is among the lightest quads on the market, shaving every ounce possible. With the Daniel Defense M4 rail no longer in production, I believe the QRF is one of the lightest, if not the lightest quads on the market. The unique thing I noted is that the tube of the rail is still one piece and circular, but the picatinny rails which are on the exterior are hollowed out from the inside. The finish is a nice flat black and the rails are de horned well enough. It’s still sharp enough to take skin off a knuckle when installing rail panels. Ask me how I know. BCM makes a solid product, but the current market is ruthless; companies are constantly trying to one up and out-design each other. Rails, stocks, and triggers are likely the biggest group of products that see new designs put out constantly. So how does the QRF compare to whats on the market? First lets breakdown some popular rails by weight. Larue 12.0 – 16.8 oz with hardware. Geissele Mk7 – 27.1 oz with hardware. BCM 12 inch QRF – 14.1 oz with hardware. Centurion C4 12 inch – 15.3 with hardware. You can see that we have a very lightweight system indeed. Having owned a G Mk4, Larue 12.0, and having installed many other designs that are not quad rails, I have a pretty good handle on the various ways you can attach a hand-guard to a standard receiver. I am pleased with the simplicity of the BCM installation, and the overall fit and finish is excellent. The barrel nut is a steel component that does not require timing to the gas tube. BCM includes (yet another) proprietary barrel wrench. The attachment system is well thought out considering the other designs on the market. What I like about BCM’s design is that it interfaces with the barrel nut with about 330 ish degrees of contact. There is lots of rail to barrel nut contact. The rail slides over the entire barrel nut like a tube over a tube. The force required to slide the rail onto the nut was a rubber mallet and some patience. Once in place, two opposing torx screws tighten over shaped nuts which presumably apply more pressure on to the barrel nut through the wall of the rail. The two opposing screws prevent the rail from slipping fore or aft via a notch in the barrel nut. As an overview, the upper receiver interface components (barrel nut, hardware, anti rotation components) get a thumbs up. The simplicity speaks to me. Compared to Larue which uses a locking plate, locking collar, anti rotation plate, needs to be timed to the receiver, etc. The BCM is easier to install and is several oz lighter. Even thought the 12.0 as been on sale for a long time, it’s still more expensive than the BCM QRF. I would not put a MK7 on a practical gun and even on a precision build the HBAR weight plus the Mk7 would be out of the question for me. Some might prefer to go as heavy as possible, but I have a personal limit and my 9lb Colt HBAR pushes that limit with the QRF installed. Personal preference. So for simplicity coupled with reduced weight and lower cost… so far this is my favorite quad rail of those I have seen and installed. The centurion looks very comparable, so if one ever makes it my way look out for a head to head. I first tried to install the QRF on to my A2 rifle. No go. The receiver dimensions are not compatible with the anti rotation tab of the QRF. So off it came and on to my High Power / Precision build. Wrapped around the Colt HBAR, the QRF felt solid, and I appreciated the aesthetics and the build quality of this quadrail system. The barrel is perfectly centered in the rail and the rifle feels solid. The ergonomics are excellent; the rail feels great with both grip panels and/ or Larue Index clips. I decided to test the BCM QRF for deflection. This is a test of the rails overall stiffness when the rail is under a load. This represents a potential zero shift when range finders, and IR lasers. To preform this test, I installed a 3-10 mil/mil optic in its standard position on the receiver and co-witnessed it with my DIO red dot on the QRF at position T 40. I remained at 3x on my optic to ensure dot sharpness and co-witnessed the red dot in the center of the cross-hairs. I then placed the setup on a Caldwell rest at the rear of the rail butted up against the magazine well, and attached a 10 lb weight on the last available slot forward on the QRF. Keeping my face in a fixed position on the stock, I raised and lowered the front of the firearm and 10lb weight 5 times to ensure I was seeing the same movement. I had to dial the following vertical clicks into my optic to re-zero the red dot during the 5 attempts: 3clicks 3clicks 4clicks 4clicks 3clicks. Ergo my perception of rail to optic movement was between 3/10s and 4/10s of a mil with a full 10 lbs of weight hanging off the gun. Certainly a worst case scenario as no equipment we might utilize weighs ten lbs. This places the QRF between 1.08 inches and 1.44 inches of deflection at 100 yards with a 10 lb weight on a 12.65 inch QRF. I then tested the deflection with only my body weight leaning on the gun which was positioned on a caldwell rest in a “bipod” type arrangement as if I was shooting prone. The bipod position revealed very little in the way of movement. When the weight was removed and the gun rested on the Caldwell rail at the most forward position on the rail, I would safely say it resulted in 1 click of adjustment or .36 inches at 100 yards of deflection using only my body weight on the rear of the rifle. This is excellent for anyone who wants to use a QRF for IR lasers and other objects attached to the rail that need to maintain zero. This is a stiff product and you should have full confidence that even though it is lightweight, it is also as stiff as you could possibly want a rail to be. Looking back over the years at the various rail setups that 20 inch guns have had, it’s plain to see that quadrails and long barrels are falling out of favor. It’s nice to have new options available that are built specifically to fit a 20 inch, FSB pattern rifle. The QRF went with me to the range and there was no event which made me question overall function. Quads can still be useful, and I have a personal theory that they may be in fact stiffer than M-Lok systems which we will evaluate once I obtain a MCMR rail of similar length. Giving your 20 a new quad rail that reduces weight and keeps the lines of the classic M16A4 is not a bad thing. At $180 ish dollars I think the QRF is a great deal for anyone who still wants to rock a quad. This rail is High Power legal so my HBAR build will pull double duty. Watch for it as I attempt to get back into High-Power. Kids have kept me sidelines for the last few years. I will be adding more BCM rail systems to rifles to standardize in the future. Disclaimer: I purchaed this rail from Brownells.com and paid cash money; at no point did I have any promotional relationship with BCM. All thoughts an opinions are my own. Trijicon Releases New AccuPoint and AccuPower Variables! I’ve been eyeballing these things for a while. I don’t have a real reason to pick one up for now, though. Maybe if my DD Omega ever fails on me. I’m glad to see that it fits nicely behind a rifle FSB. The quad may not be the sexiest thing on the market anymore, but I don’t think they’re going anywhere for a long time. Yea I have gone through way to many quads and rails than I am proud to admit. DD still lists their M4’s as “in stock.” They’re a little over twice the price of this BCM though. Good review. I bought one of these on day one of release. Its been on two different rifles and now calls my SPR home. I absolutely love this rail, best install method I’ve found using a little heat no need for a mallet. I too was surprised how light it actually is in handling. To save even a bit more weight, VSeven makes a titanium barrel nut that will fit this, the KMR, and the MCMR, would save even more weight on it.